Lovely par 4 where tee shot needs to be right of centre of the fairway. With the Wool Wood surrounding the left of the fairway and the back of the green all of which is out of bounds. Your second shot into the must be precise to find this very tricky green, anything left of the green will have you struggling to scramble a par. Tip - for second shot to the green don’t be left as the green has a large banking sloping from left side. New Woll Estate & The Woll Golf Course & Restaurant is owned by the Brown Family. 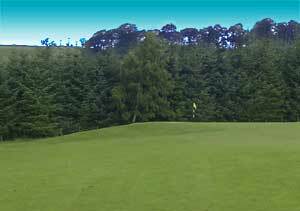 Run as a friendly family business it is one of the most popular resorts, golf courses and restaurants in the Scottish Borders. Attracting members, visitors and diners from all over the Scottish Borders, UK and abroad. We pride ourselves on the quality of our facilities and the service our staff provide. Open to everyone, you are sure of a warm welcome. © 2003-2019 by Woll Golf Course. All rights reserved.